Retrocompilations - There are hundreds of them for nearly every system and nearly every big publisher released in the past years some sort of retrospective compilation. Even Sega released a compilation of Mega Drive/Genesis Games for the Playstation 2. Back in the early 90s at a time where the Master System was not quite retro it became also a compilation of old classics: Arcade Smash Hits. Included are three Games: Centipede, Breakout and Missile Command. In Centipede your Mission is to kill a worm who's running down from the top of the screen. Everytime it hits a fungus he slides down one row. You control a little gun and have to shoot it. If you hit the first or last part it disappears, but if you hit him in the middle it splits in two which makes the whole game a bit more difficult. You lose a life if the centipede hits the bottom of the screen. There's nothing more to write about it. Centipede is a nice little game which still makes a lot of fun, but for not more than maybe 5 or 10 minutes. The second game is Breakout. A game which had many sequels and clones, it was even included as a Bonus in other games, for example Commander Keen 4. You control a paddle and with this paddle you hit a ball. Your mission is to destroy rows of stones with the ball. The main problem with the game is, that it was even back in 1992 fairly old and there were better games with this gameplay, the prime example would be Arkanoid. In Breakout there are no monster on the top of the screen to kill, no powerup pill that gives you multi-balls or a laser. At least there are different shapes of walls to destroy. The last Smash Hit is Missile Command. One of the real great classics. Your mission is to defend six cities which are attacked by rockets flying from the sky. 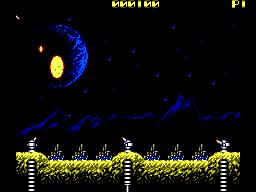 The player has three rocketstations with whom you must destroy the rockets. The game is fairly simple but hard to master and quite addictive. It still makes a lot of fun. The music is....funky and annoying at the same time. The main problem i had with it, is that the music is too high pitched and mainly uses the high frequencies. A little more bass would've been great. On the other hand the soundeffects are too low on volume. You can barely hear when you destroy a rocket in Missile Command and in Breakout there is only some little noise when the Ball hits something. It's really not great. There is also a voice saying Let's Go on the start of every game. Here's another problem i had with this game. All those game came into the arcade with their own controle type. Breakout used a little wheel while Missile Command and Centipede used a Trackball and they were of course analog. On the Master System you have the gamepad with a digital D-Pad. Especially in Missile Command and Breakout the controls are awkward. It just doesn't controle that good or fast you need in the higher levels. Breakout and Centipede only use Button to shoot the ball into play and/or to shoot at the worm. Missile Command uses the second button to switch from one rocketstation to the next. Sure, all three games are classics and have their place in video game history but that doesn't mean you can still play them some hours. 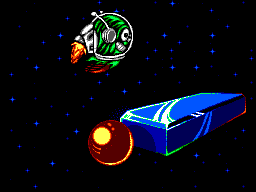 While Missile Command is still a great game, Breakout and Centipede are just boring. 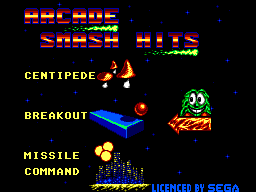 In my oppinion Arcade Smash Hits would have been way better if they used Arkanoid and Millipede instead.